The Hershey Chocolate Factory is important as a reflection of industrial processes and buildings of its time, and reflects changing trends in manufacturing and human consumption. As the heart of the company town that developed according to Milton Hershey’s vision, the chocolate factory is central to the story of Hershey. In addition to being the economic driver that built and sustained the community of Hershey, the Hershey Chocolate Factory has long been important to visitors. The first public tours f the factory were given in 1927, and by 1972, more than 10 million people had visited the factory. Public tours of the Hershey Chocolate Factory ceased in 1973, but hundreds of thousands of visitors still flock to Chocolate World each year to take a virtual tour of Hershey’s chocolate production. Even though many have not been to Hershey to visit the large downtown industrial property, people across the country feel a connection to this historic building and are concerned about its preservation. As a result of changing manufacturing and economic practices, including the construction of a $300 million expansion to the company’s West Hershey facility just outside of town, the Hershey Chocolate Factory is no longer able to be used effectively for its original purpose. The numerous buildings that comprise the factory are functionally obsolete. As a result, the Hershey Company has rehabilitated the oldest remaining portions of the complex for continued use as their offices, and proposes to demolish the rest, retaining the iconic Hershey Cocoa bushes and the smoke stacks at the facility’s power plant. The physical limitations imposed by the complex historic structure, the technical challenges associated with satisfying current building codes, and modern parking requirements make it impossible for Hershey to justify the high cost of rehabilitating this large industrial complex in a busy downtown. The Hershey Company has met with developers and attempted to find a feasible new use for the factory but has been unable to do so. Demolition of the interior portions of the building has begun. For the most part, there are no regulations in place to prevent the demolition of this privately owned property using private money. Derry Township’s Design Review Board did have an opportunity to review the proposed demolition of the buildings along Chocolate Avenue and could have recommended denial of a Certificate of Appropriateness, which may have delayed demolition. However, at the end of a lengthy public meeting during which representatives of the Hershey Company explained the rationale for having to demolish the structures, the Board voted to authorize the Certificate. The Hershey Company plans to raze the remainder of the chocolate factory over the next 12 to 18 months. Preservation Pennsylvania has received unprecedented outreach from people hoping to see this factory, or at least a significant portion of it, preserved. We hope to work with the Hershey Company and others to try again to find an alternative to demolition. A rehabilitation option that preserves the features that define the historic character of the property while allowing it to change to accommodate new use may exist, if the right partners are involved in the process and the right intervention tools are made available. There is no architectural element in our historic architecture more nostalgic than the American porch. We remember playing on them as kids. We hung out on them with our friends as teenagers (probably stealing a kiss or two we weren't supposed to have yet). We sat on them as adults sipping iced tea on hot summer evenings. We visited with friends and family laughing and playing cards. We sat on them to watch parades. Some of us even slept on them to escape the oppressive heat inside on hot summer nights. But where did porches come from and how did they become the porches we know today? Here's a quick primer on the history of the American porch. Porches in the south were called “verandas”, a term that reflected British colonial design influences from India. This term would eventually become the dominant term along the East Coast. Porches in the French colonial areas of the deep South wrapped around the entire house and were referred to as “galleries”. Porches in Spanish colonial architecture were called “arcades”. The growing middle class builds homes with elaborate porches dressed with fancy millwork in new suburban neighborhoods. Highly decorated wrap-around Queen Anne style porches became wildly popular and are even added to small and simple houses. Porches are now used as outdoor living spaces and their shaded and landscaped privacy offered a discreet meeting spot in an age obsessed with propriety. Growing understanding and acceptance of germ theory brings medicinal value to porches as doctors begin touting the benefits of fresh air. Hipped roofs and exposed rafters hit the scene on porches with bungalow architecture. SLEEPING PORCHES BECOME A POPULAR AS TUBERCULOSIS SOARS. As autos hit the roads, porches move to the side of the house as we retreat from the noise and dirt and seek more privacy. Eventually they will end up at the back of the house where they will predominantly stay in new architecture for the next fifty or sixty years. Victor Moore’s Junk Castle in Washington State There was this guy who lived in Washington State who wanted to do something funky for his Master of Fine Arts thesis so he built a castle out of junk in his yard. He used all salvaged materials from a local junkyard and a nearby defunct rock quarry. This happened back in 1970 so it was probably quite a sensation at the time. The guy’s name was Victor Moore and he went on to teach high school art and to inspire hundreds of students to do more with less, so to speak......Continue reading Exploring western ghost towns: Ashcroft Colorado This past Labor Day weekend, I dragged my reluctant family on a jaunt up into the Colorado high country to find a certain ghost town known as Ashcroft. Located 11 miles outside of Aspen, Ashcroft is easily accessible and the site is well-tended by the Aspen Historical Society. On a bright sunny Colorado day, we traversed the short trail and came upon the remains of Ashcroft......Continue reading Waterville, Vermont Playground You never know where or when you will come across an awesome historic playground! The small town of Waterville, Vermont is such an example. The current library and town offices are housed in the former Waterville Central School, which is a classic 1930s two-room schoolhouse (a relatively common building type in Vermont)......Continue readingThis article is a part of a series from the Pennsylvania Historical and Museum Commission’s excellent field guide on the architectural styles found in Pennsylvania. In it, they’ve assigned key periods of development – from the Colonial period in the 18th Century to the Modern Movements of the 29th Century. This article focuses on an overview of the Traditional/Vernacular style in Pennsylvania from 1638 through 1950 PA Architecture Colonial Period 1640 - 1800 The Colonial Period in Pennsylvania covers the era from the arrival of the first European settlers in the mid 1600s to 1776 when the nation was formed and Pennsylvania was no longer a colony of England. While the earliest colonists to settle in what would become Pennsylvania were from Sweden, the Netherlands and Finland, colonists from England and later Germany would soon predominate following William Penn’s arrival in 1682. The earliest settlements within Pennsylvania’s current boundaries (at one time the state of Delaware was part of Pennsylvania, making up the three lower counties) were Swedish, part of the colony of New Sweden. There were about a dozen small permanent Swedish/Finnish settlements along the Delaware River, the earliest in Pennsylvania being Finland and Upland founded in 1641 near present day Chester. With the arrival of William Penn, the Proprietor of the colony of Pennsylvania, and other English Quakers in 1682, colonial growth spread northward and westward from the mouth of the Delaware River. As a refuge from religious persecution, the colony grew and attracted settlers from many countries, but in the Pre-Revolutionary War period, most colonists were of English, German and Scotts-Irish ancestry. The first buildings in Pennsylvania were simple, traditional structures, built according to folk designs common in the colonists’ country of origin. These traditional or vernacular buildings were built not just in the Colonial period, but throughout the settlement period of the state. This building tradition is important in its own right and is fully detailed on the Traditional/Vernacular style section of this field guide. 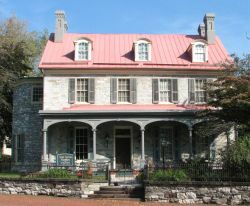 The only true architect-inspired style of the Colonial period often found in Pennsylvania is the Georgian style. This style, based on the classical forms of the Italian Renaissance, originally developed in England in the 17th century and was introduced in the colonies around 1700. It was the prevailing style in Pennsylvania for about 100 years, from 1700 until 1800. In the early 1700′s, Harrisburg’s founder John Harris Sr. immigrated to the area from Yorkshire, England after receiving a land grant. When he first arrived, Harris Sr. built a homestead on the bank of the Susquehanna River and established a trading post, and then a successful ferry business that would funnel much of the Scottish, irish, and German immigrants west for over fifty years. Known for his fair dealings and good relationship with local Native Americans, Harris Sr.’s also facilitated successful relationships between new settlers and the local Native American population. 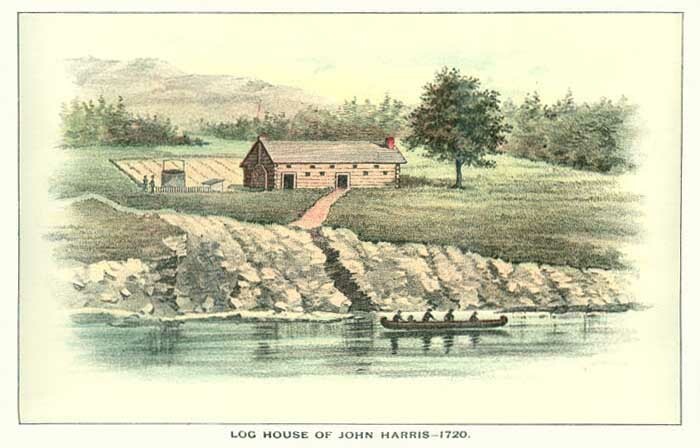 After Harris Sr. died in 1748, John Harris Jr. inherited the homestead and business and continued the family legacy of good relationships with local Native Americans – during the French and Indian War two notable “council fires” were held at the Harris home for talks between the Indian Nations, local governing officials, and British representatives. In 1766, after the French and Indian War ended, Harris Jr. decided it was time for a more substantial house for the family. Tired of evacuating their current homestead whenever the river flooded, Harris Jr. chose the current site of the mansion after observing that even during the worst flooding, the river had never reached the top of the rise in the ground the mansion sits on. Originally constructed in the Georgian style of architecture using locally quarried limestone, the house had a total of eight owners over the years and each made changes to the house. In the early 1800′s a rear wing was added to the original mansion, and in 1863 the house underwent significant changes when Simon Cameron (seven-time U.S. Senator, President Lincoln’s first Secretary of War, and former Ambassador to Russia) purchased the house. In the early 1900′s, Cameron’s grandson Richard Haldeman, the last of the Cameron family to live in the home, made more changes when he redecorated, modernized the mansion, and added the West Alcove to the house. When he died, his sister donated the house and other family items to the Historical Society of Dauphin County. In 2013, we were contracted to repair and restore the Victorian style porch. The porch was in disrepair – the brick piers that supported the floor were falling apart, the corner of the roof system was completely rotted out, there was a vermin infestation underneath the porch that was compromising the structural stability of the porch. In addition to the disrepair, there had been alterations to the style of the porch over the years and the Historical Society wanted the porch both repaired and returned to its original style. The major contributing problem that needed to be addressed was that the spouting and gutters weren’t emptying water away from the porch because the porch had settled and moved. There had been attempts to repair the porch to keep it from settling, but they didn’t last or weren’t correct repairs – at one point someone had actually strapped the porch to the stone house wall to try and keep it from sliding by putting metal gussets at the spots where the framing was coming apart and separating at the corners. But no one had ever addressed the problems with the porch foundation which was causing the settling and moving. For the project, we started with demolition – a very careful demolition. There were a lot of important materials on the porch that we encased in plywood boxes to protect them during the demolition process. The stone where George Washington stood in 1780… An original sandstone step that was already cracked… All the important elements of the porch were carefully protected to prevent any damage during the construction process. After demolition, we addressed the foundation issues by pouring five concrete footers at each of the column locations since that is where the porch had been failing and where the roof was sagging. There had been brick piers there that we rebuilt with a combining of the existing brick and salvaged brick we purchased to match, but there had never been a frost-line footer under the porch. All of the existing trim, arches, columns, floor, and skirtboard that could be salvaged were brought back to our shop where we removed the lead paint, repaired the pieces where necessary, fabricated new pieces as needed to match existing pieces, and reassembled them. We fabricated new columns and elliptical arches from mahogany wood to match the style of the existing columns and arches that were re-used. Several columns still had the original trim that we could copy when turning all of the capitals and column pieces. We were able to level and save the porch roof by putting a large, carrier beam on the front of it. We also put all of the columns and capitals on metal pipes before we installed them so we could put the columns on without cutting them in half. The flooring and ceiling also needed repaired and replaced at some spots. The original wood was vertical fir, but using fir would have been tremendously costly. Mahogany was chosen instead for its availability and its cost. While mahogany would not have been used as an exterior wood when the porch was originally built, it is an acceptable replacement material in preservation standards and actually holds up better as an exterior wood than many original woods. This project was a collaborative effort between Richard Gribble at Murphy & Dittenhafer Architects, McCoy Brothers, and the Historical Society of Dauphin County, and us. 1We recently completed a historic porch restoration at the Harris-Cameron mansion in Harrisburg, PA. Part of the project involved fabricating new wood columns to match a few existing column we were salvaging. For that work we turned to Somerset Door & Column Company. For over 100 years, Somerset Door & Column Company has manufactured architectural wood columns, doors, and entryways. Built on tradition and authenticity, Somerset Door & Column uses trained artisan craftsmen and kiln-dried domestic and imported hardwoods to create long-lasting, high-quality custom doors and columns. While some manufacturers outsource parts of their production process, Somerset maintains complete control over the quality of their production process by fabricating everything on-site at their facilities. We had previously worked with Somerset Door & Column on another historic porch restoration we did in Staten Island and knew their quality of work was commendable. Chuck is picky about the vendors and contractors we work with and he gives Somerset a solid two thumbs up. "There isn't anything they can't do", he says. Originally known as the State Theater, the Hanover Theater began its 58-year run as a movie and live performance venue in 1928. The theater combines elements of the Spanish Colonial Revival and Moderne styles and has an extravagant Arthur Brounet interior. The building was used as a theater until 1986, but has been used minimally for storage purposes since then. The theater is in need of repairs and modernization of amenities. Under the impression that an organization called Casual Arts would acquire the theater and begin rehabilitating it after two years, a group of committed individuals formed a holding company called Historic Hanover Theater, LLC in 2007 and paid $500,000 to purchase and stabilize the building. Casual Arts did not follow through in 2009. Without the financial resources to rehabilitate the building themselves, Historic Hanover Theater began seeking a new owner with the intention and capacity to acquire and restore the unique venue. By June of 2011, no interested parties stepped forward, so Historic Hanover Theater was forced to offer it for sale on the open market. The resident caretaker moved out of the building, making it more susceptible to vandalism. The size and location of the Hanover Theater make it vulnerable to conversion to apartments, retail or other uses that would not allow for the retention of the theater’s character-defining features. With parking at a premium and a common community perception that the building is unattractive and perhaps unstable, many are calling for the demolition of this historic downtown theater. During the past year, there has been significant activity in Hanover that could help to preserve this resource and revitalize the downtown. A group interested in acquiring the Hanover Theater and rehabilitating it as a performance venue is organizing and working to develop the capacity to take on a project of this nature and scale. This is happening in conjunction with significant momentum in the community to hire a Main Street Manager and develop a convention center in other historic buildings downtown, among other activities. While the Hanover Theater is still at risk of damage from neglect, incompatible alterations and even demolition, it appears that the community of Hanover is taking the right steps to work toward downtown preservation and revitalization, likely including the Hanover Theater.This article is a part of a series from the Pennsylvania Historical and Museum Commission’s excellent field guide on the architectural styles found in Pennsylvania. In it, they’ve assigned key periods of development – from the Colonial period in the 18th Century to the Modern Movements of the 29th Century. This article focuses on an overview of the Traditional/Vernacular style in Pennsylvania from 1638 through 1950 PA Architecture Early Republic Period 1780 - 1830 The Early Republic Period marks the era when the English colonies declared their independence and the young nation was first established. The predominant style in this period was the Federal or Adam style, a refined version of the previously popular Georgian style. Federal style buildings were common in the period from 1780 to about 1830 and were distinguishable from their earlier Georgian counterparts mostly by the more delicate and elaborate classical details on similar symmetrical facades. The other style to develop in this period was the Early Classical Revival or Greek Revival style which drew its design inspiration more directly from the ancient buildings of Greece and Rome. This Early Classical Revival style continued to be employed for much of the nineteenth century, especially for buildings in public use, schools, churches, banks and government offices. Preservation Pennsylvania has released their “Pennsylvania At-Risk: Twenty-Year Retrospective of Pennsylvania’s Endangered Historic Properties, Where Are They Now” edition. It’s a fascinating look at preservation in action and we’ll be posting a look at each property in a series of posts over the next several months. Preservation Pennsylvania established the annual Pennsylvania At Risk list in 1992, making us the first statewide preservation organization in the United States to have an annual roster of endangered historic properties. Since 1992, we have listed and worked to preserve more than 200 endangered historic resources, including individual buildings, historic districts and thematic resources statewide. For 2012, as we celebrate the 30th anniversary of our organization, we are presenting a 20-year retrospective edition of Pennsylvania At Risk. In this issue, we revisit some of the amazing historic places across the Commonwealth, some of which have been rescued from extinction through preservation and rehabilitation efforts, and others that still need our help. Approximately 18% of Pennsylvania’s At Risk properties have been lost, having been demolished or substantially altered. Another 32% have been saved or are in a condition or situation where the identified threat no longer poses a problem for the historic property. Approximately 50% of the 201 At Risk resources remain in danger, or we have not been able to confirm their current status as either saved or lost. By monitoring these properties over the past 20 years and working with individuals and organizations trying to preserve them, we have learned many valuable lessons. Those lessons are called out throughout this publication. The Hershey Chocolate Factory is important as a reflection of industrial processes and buildings of its time, and reflects changing trends in manufacturing and human consumption. As the heart of the company town that developed according to Milton Hershey’s vision, the chocolate factory is central to the story of Hershey. In addition to being the economic driver that built and sustained the community of Hershey, the Hershey Chocolate Factory has long been important to visitors. The first public tours f the factory were given in 1927, and by 1972, more than 10 million people had visited the factory. Public tours of the Hershey Chocolate Factory ceased in 1973, but hundreds of thousands of visitors still flock to Chocolate World each year to take a virtual tour of Hershey’s chocolate production. Even though many have not been to Hershey to visit the large downtown industrial property, people across the country feel a connection to this historic building and are concerned about its preservation. As a result of changing manufacturing and economic practices, including the construction of a $300 million expansion to the company’s West Hershey facility just outside of town, the Hershey Chocolate Factory is no longer able to be used effectively for its original purpose. The numerous buildings that comprise the factory are functionally obsolete. As a result, the Hershey Company has rehabilitated the oldest remaining portions of the complex for continued use as their offices, and proposes to demolish the rest, retaining the iconic Hershey Cocoa bushes and the smoke stacks at the facility’s power plant. The physical limitations imposed by the complex historic structure, the technical challenges associated with satisfying current building codes, and modern parking requirements make it impossible for Hershey to justify the high cost of rehabilitating this large industrial complex in a busy downtown. The Hershey Company has met with developers and attempted to find a feasible new use for the factory but has been unable to do so. Demolition of the interior portions of the building has begun. For the most part, there are no regulations in place to prevent the demolition of this privately owned property using private money. Derry Township’s Design Review Board did have an opportunity to review the proposed demolition of the buildings along Chocolate Avenue and could have recommended denial of a Certificate of Appropriateness, which may have delayed demolition. However, at the end of a lengthy public meeting during which representatives of the Hershey Company explained the rationale for having to demolish the structures, the Board voted to authorize the Certificate. The Hershey Company plans to raze the remainder of the chocolate factory over the next 12 to 18 months. Preservation Pennsylvania has received unprecedented outreach from people hoping to see this factory, or at least a significant portion of it, preserved. We hope to work with the Hershey Company and others to try again to find an alternative to demolition. 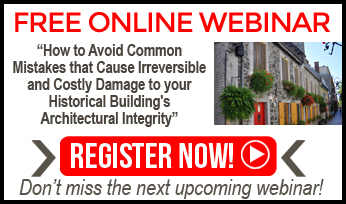 A rehabilitation option that preserves the features that define the historic character of the property while allowing it to change to accommodate new use may exist, if the right partners are involved in the process and the right intervention tools are made available. There is no architectural element in our historic architecture more nostalgic than the American porch. We remember playing on them as kids. We hung out on them with our friends as teenagers (probably stealing a kiss or two we weren’t supposed to have yet). We sat on them as adults sipping iced tea on hot summer evenings. We visited with friends and family laughing and playing cards. We sat on them to watch parades. Some of us even slept on them to escape the oppressive heat inside on hot summer nights. But where did porches come from and how did they become the porches we know today? Here’s a quick primer on the history of the American porch. The Colonial Period in Pennsylvania covers the era from the arrival of the first European settlers in the mid 1600s to 1776 when the nation was formed and Pennsylvania was no longer a colony of England. While the earliest colonists to settle in what would become Pennsylvania were from Sweden, the Netherlands and Finland, colonists from England and later Germany would soon predominate following William Penn’s arrival in 1682. The earliest settlements within Pennsylvania’s current boundaries (at one time the state of Delaware was part of Pennsylvania, making up the three lower counties) were Swedish, part of the colony of New Sweden. There were about a dozen small permanent Swedish/Finnish settlements along the Delaware River, the earliest in Pennsylvania being Finland and Upland founded in 1641 near present day Chester. With the arrival of William Penn, the Proprietor of the colony of Pennsylvania, and other English Quakers in 1682, colonial growth spread northward and westward from the mouth of the Delaware River. As a refuge from religious persecution, the colony grew and attracted settlers from many countries, but in the Pre-Revolutionary War period, most colonists were of English, German and Scotts-Irish ancestry. The first buildings in Pennsylvania were simple, traditional structures, built according to folk designs common in the colonists’ country of origin. These traditional or vernacular buildings were built not just in the Colonial period, but throughout the settlement period of the state. This building tradition is important in its own right and is fully detailed on the Traditional/Vernacular style section of this field guide. In the early 1700′s, Harrisburg’s founder John Harris Sr. immigrated to the area from Yorkshire, England after receiving a land grant. When he first arrived, Harris Sr. built a homestead on the bank of the Susquehanna River and established a trading post, and then a successful ferry business that would funnel much of the Scottish, irish, and German immigrants west for over fifty years. Known for his fair dealings and good relationship with local Native Americans, Harris Sr.’s also facilitated successful relationships between new settlers and the local Native American population. After Harris Sr. died in 1748, John Harris Jr. inherited the homestead and business and continued the family legacy of good relationships with local Native Americans – during the French and Indian War two notable “council fires” were held at the Harris home for talks between the Indian Nations, local governing officials, and British representatives. In 1766, after the French and Indian War ended, Harris Jr. decided it was time for a more substantial house for the family. Tired of evacuating their current homestead whenever the river flooded, Harris Jr. chose the current site of the mansion after observing that even during the worst flooding, the river had never reached the top of the rise in the ground the mansion sits on. Originally constructed in the Georgian style of architecture using locally quarried limestone, the house had a total of eight owners over the years and each made changes to the house. 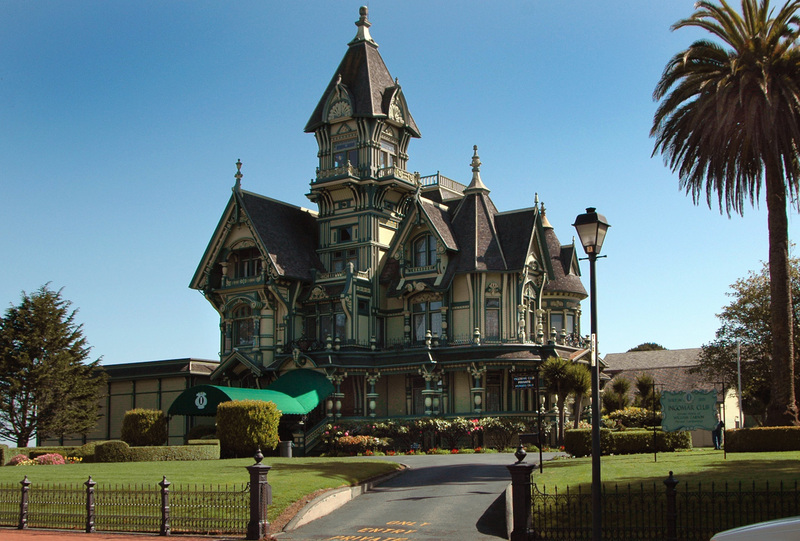 In the early 1800′s a rear wing was added to the original mansion, and in 1863 the house underwent significant changes when Simon Cameron (seven-time U.S. Senator, President Lincoln’s first Secretary of War, and former Ambassador to Russia) purchased the house. “Having made an offer of $8,000 for the Harris Mansion, Cameron left for Russia. He traveled throughout Europe and stopped in England, France, Italy, and the German states. While making his way to Russia, Cameron was shopping for furnishings for his new house. In the parlor are two 14-foot-tall (4.3 m) pier mirrors, as well as mirrors above the fireplaces that came from France. The fireplace mantles are hand-carved Italian marble, and the alcove window glass is from Bavaria. In 2013, we were contracted to repair and restore the Victorian style porch. The porch was in disrepair – the brick piers that supported the floor were falling apart, the corner of the roof system was completely rotted out, there was a vermin infestation underneath the porch that was compromising the structural stability of the porch. In addition to the disrepair, there had been alterations to the style of the porch over the years and the Historical Society wanted the porch both repaired and returned to its original style. The major contributing problem that needed to be addressed was that the spouting and gutters weren’t emptying water away from the porch because the porch had settled and moved. There had been attempts to repair the porch to keep it from settling, but they didn’t last or weren’t correct repairs – at one point someone had actually strapped the porch to the stone house wall to try and keep it from sliding by putting metal gussets at the spots where the framing was coming apart and separating at the corners. But no one had ever addressed the problems with the porch foundation which was causing the settling and moving. For the project, we started with demolition – a very careful demolition. There were a lot of important materials on the porch that we encased in plywood boxes to protect them during the demolition process. The stone where George Washington stood in 1780… An original sandstone step that was already cracked… All the important elements of the porch were carefully protected to prevent any damage during the construction process. After demolition, we addressed the foundation issues by pouring five concrete footers at each of the column locations since that is where the porch had been failing and where the roof was sagging. There had been brick piers there that we rebuilt with a combining of the existing brick and salvaged brick we purchased to match, but there had never been a frost-line footer under the porch. All of the existing trim, arches, columns, floor, and skirtboard that could be salvaged were brought back to our shop where we removed the lead paint, repaired the pieces where necessary, fabricated new pieces as needed to match existing pieces, and reassembled them. We fabricated new columns and elliptical arches from mahogany wood to match the style of the existing columns and arches that were re-used. Several columns still had the original trim that we could copy when turning all of the capitals and column pieces. We were able to level and save the porch roof by putting a large, carrier beam on the front of it. We also put all of the columns and capitals on metal pipes before we installed them so we could put the columns on without cutting them in half. The flooring and ceiling also needed repaired and replaced at some spots. The original wood was vertical fir, but using fir would have been tremendously costly. Mahogany was chosen instead for its availability and its cost. While mahogany would not have been used as an exterior wood when the porch was originally built, it is an acceptable replacement material in preservation standards and actually holds up better as an exterior wood than many original woods. This project was a collaborative effort between Richard Gribble at Murphy & Dittenhafer Architects, McCoy Brothers, and the Historical Society of Dauphin County, and us. Pablo Picasso’s former home/studio is for sale! 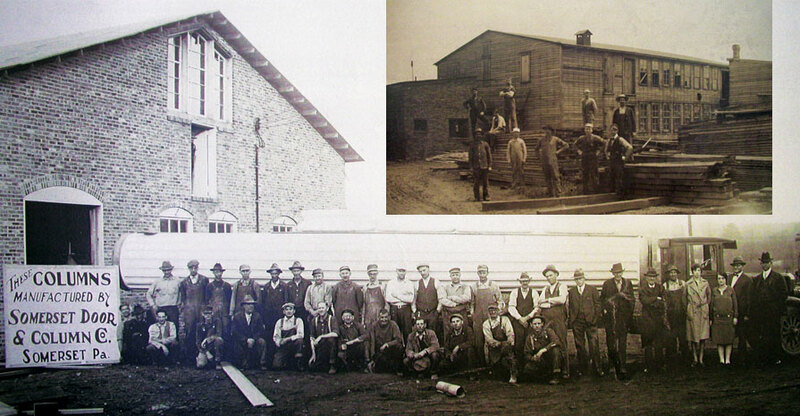 One of the most modern breweries in the United States when it opened in 1913, Neuweiler Brewery survived prohibition and continued to operate until 1968. The property has been largely vacant for more than 40 years, its buildings neglected and deteriorated. As a result of condemnation proceedings that concluded in September 2009, the Redevelopment Authority of the City of Allentown (RACA) took ownership of the property. They commissioned a structural assessment of the property, which showed that the surviving elements of the industrial complex are structurally sound. In June 2011, the site was included in a 128-acre area designated as the Neighborhood Improvement Zone (NIZ), which allows qualified state and local tax revenues to be used for payment of debt service on bonds or loans issued for the development project. RACA conducted a Phase I Environmental Site Assessment for the property in October 2011; cleanup of the site and remediation of hazardous materials is in progress. In November of 2011, the public Allentown Commercial & Industrial Development Authority (ACIDA) acquired the property and continued RACA’s effort to prepare the property for redevelopment. In July 2012, a Site Reuse Study was completed for the property. This study included a comprehensive analysis of physical facilities, historic structures, and financial feasibility and tested five proposed reuse alternatives for the site. Several potential new uses for the historic brewery property exist, but none are economically viable without significant financial intervention. The Site Reuse Study concluded that the preferred alternative was to demolish two of the complex’s buildings and rehabilitate the remaining buildings for use as a combination of residential apartments, retail and office space, and a restaurant and brew pub. However, the demolition may mean that the property is not eligible for rehabilitation investment tax credits. Without the financial incentive provided by the tax credits, the Site Reuse Study found that it was then more feasible to preserve all of the historic buildings for a mixed-use rehabilitation. Neuweiler Brewery features prominently in the 2012 Lehigh River Waterfront Master Plan, which provides an overall strategy to direct a phased development approach to the redevelopment of approximately 120 acres along the river, utilizing the unique character and heritage of the area. With the inclusion in the NIZ, site cleanup complete, and the guidance of the Existing Conditions, Site Reuse Study and Waterfront Master Plan, prospective developers have the tools they need to develop the property. Development proposals are currently being considered. Revival and Moderne styles and has an extravagant Arthur Brounet interior. The building was used as a theater until 1986, but has been used minimally for storage purposes since then. The theater is in need of repairs and modernization of amenities. Under the impression that an organization called Casual Arts would acquire the theater and begin rehabilitating it after two years, a group of committed individuals formed a holding company called Historic Hanover Theater, LLC in 2007 and paid $500,000 to purchase and stabilize the building. Casual Arts did not follow through in 2009. Without the financial resources to rehabilitate the building themselves, Historic Hanover Theater began seeking a new owner with the intention and capacity to acquire and restore the unique venue. By June of 2011, no interested parties stepped forward, so Historic Hanover Theater was forced to offer it for sale on the open market. The resident caretaker moved out of the building, making it more susceptible to vandalism. The size and location of the Hanover Theater make it vulnerable to conversion to apartments, retail or other uses that would not allow for the retention of the theater’s character-defining features. With parking at a premium and a common community perception that the building is unattractive and perhaps unstable, many are calling for the demolition of this historic downtown theater. During the past year, there has been significant activity in Hanover that could help to preserve this resource and revitalize the downtown. A group interested in acquiring the Hanover Theater and rehabilitating it as a performance venue is organizing and working to develop the capacity to take on a project of this nature and scale. This is happening in conjunction with significant momentum in the community to hire a Main Street Manager and develop a convention center in other historic buildings downtown, among other activities. While the Hanover Theater is still at risk of damage from neglect, incompatible alterations and even demolition, it appears that the community of Hanover is taking the right steps to work toward downtown preservation and revitalization, likely including the Hanover Theater. The Early Republic Period marks the era when the English colonies declared their independence and the young nation was first established. The predominant style in this period was the Federal or Adam style, a refined version of the previously popular Georgian style. Federal style buildings were common in the period from 1780 to about 1830 and were distinguishable from their earlier Georgian counterparts mostly by the more delicate and elaborate classical details on similar symmetrical facades. The other style to develop in this period was the Early Classical Revival or Greek Revival style which drew its design inspiration more directly from the ancient buildings of Greece and Rome. This Early Classical Revival style continued to be employed for much of the nineteenth century, especially for buildings in public use, schools, churches, banks and government offices.